Here's a guest post from @ShamblesCrafts aka Abby, who answered my plea for a guest post. Here she bemoans the lack of vegetarian cookbooks that inspire. As an aside, if you missed it earlier in the year, here are my favourite cookbooks. One of the main problems with being a vegetarian is the dreaded cookbooks. Quite often they can be found entitled with such inspiring themes as “The Vegetarian Cookbook” as though you only need one book to see you through. Poor vegetarians. Recently there has been a trend towards vegetarianism and, as with all things trendy, suddenly there are a number of actually decent recipe books out there. I’m going to share with you my favourite current cookbook. A book which has yet to fail me; no dish has been a let-down, no recipe so confusing you give up half way, no concept so alien it’s scary to try. In the interest of fairness – there are a few ingredients which can be tricky to get, but I’ve found my local shops more reliable than supermarkets. One good thing about curry is that it can transcend any “ism”. It comes from a culture where a large proportion are vegetarian so there is no search for a replacement for meat. These dishes are supposed to be vegetarian and therefore are amazing as they are. I’ve made the dishes in this book for people I couldn’t imagine having a meal without meat. They’ve found nothing lacking and have been surprised at themselves; even going so far as to request a particular dish to be made again, or asking for the recipe for a dish. I’ve even managed to get my husband to say a satay is tasty and he _hates_ peanuts . Some of my (well everyone’s) favourite dishes are Wattana Ni Kachori (spiced pea and garlic chapatti balls), Renghan Reveya (round aubergine satay), and Khudi (spiced yoghurt soup). If these all sound a little too different for you I can also recommend the Paneer Tikka and Bombay Bataka (tamarind, tomato and potato curry). Try these and you’ll soon be trying some of the more different recipes in the book. The book is very good for a casual cook to jump into and started using without any prior experience or knowledge of the cuisine. It very handily has a number of sample menus at the back which allow you to plan a meal from a quick supper to a special occasion feast. I’ve attempted and successfully carried out the feast twice. It’s some work but so worth it if you do get time or have a reason to do it. I would recommend this book to anyone. Literally anyone; vegetarian or not. I can tell you are dying to know what the book is so I’ll tell you. 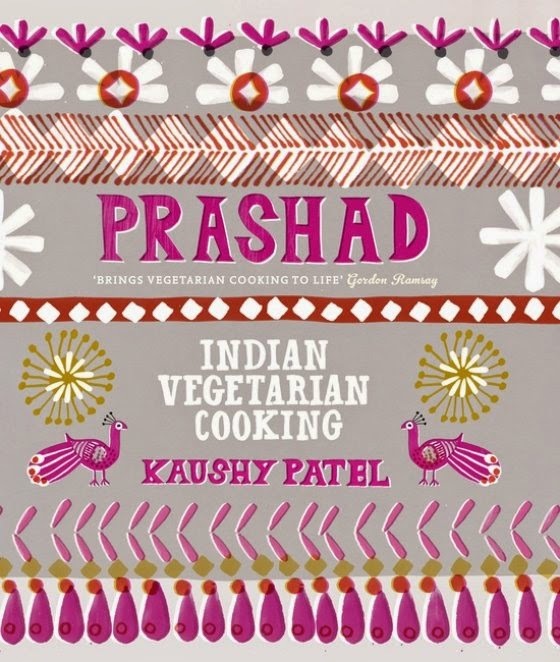 It’s Prashad by Kaushy Patel. A book based on Northern Indian cooking.